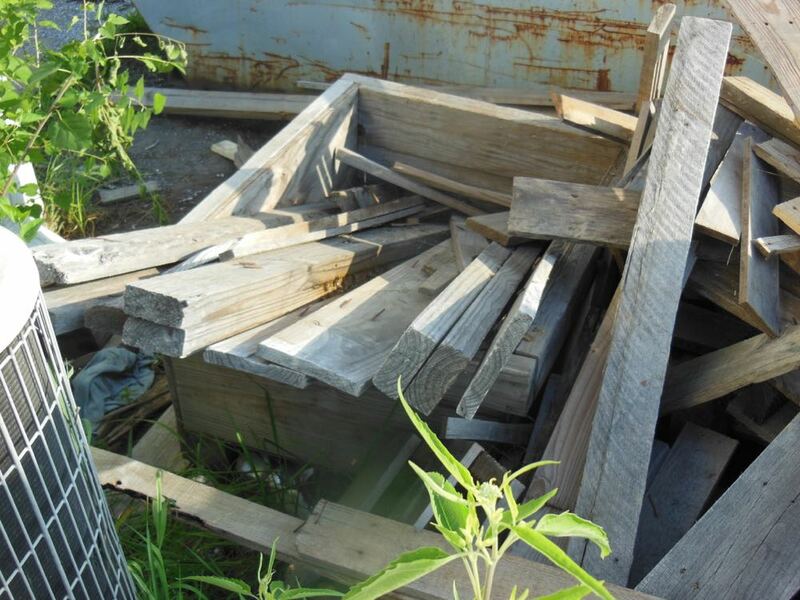 This is the wood pile where the caller said he had seen bees flying. It's cold and possibly snowing again so here is one of the bee rescues David Draker and I completed a couple of years ago. 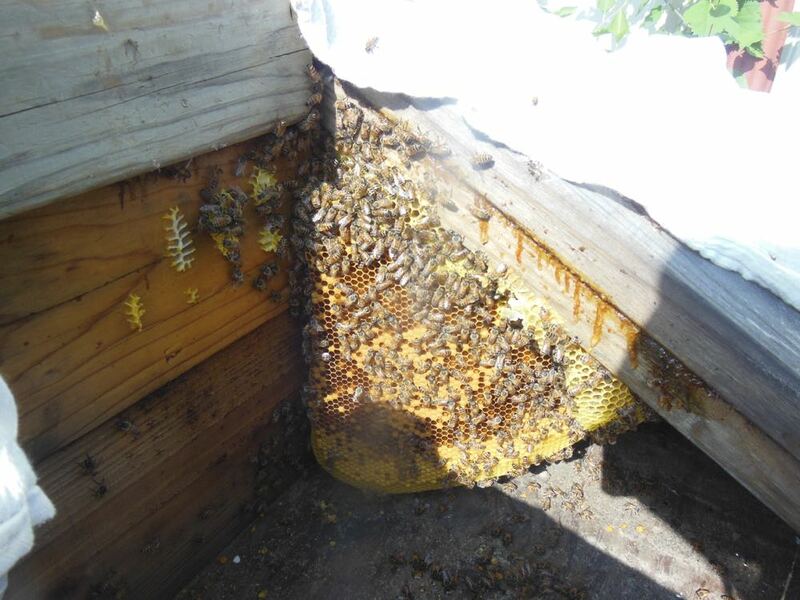 The caller worked at a St. James Industrial Park business and noticed bees flying around one of their scrap wood piles, telling us a swarm had moved in. When we arrived, it looked relatively quiet but then we were also there early morning, before the sun was up for very long, and before anything had warmed up, including us. As we checked out the wood pile, some little faces popped up. 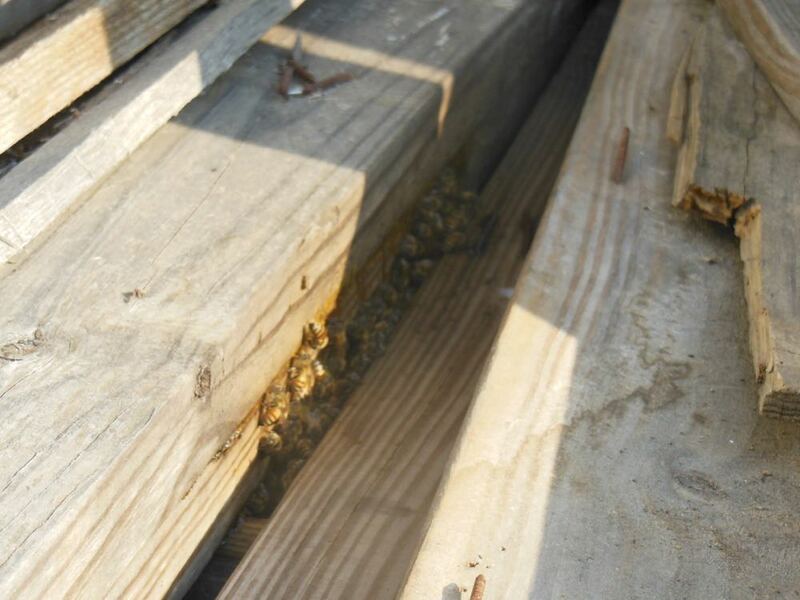 Honey bees appear in between wood pieces in the scrap wood pile as the sun hits them. And then a few more. On closer inspection, we found the honey bees had not just moved in, they had been busy for awhile. Beautiful yellow comb had been built on the wooden pieces piled into the wood pile. 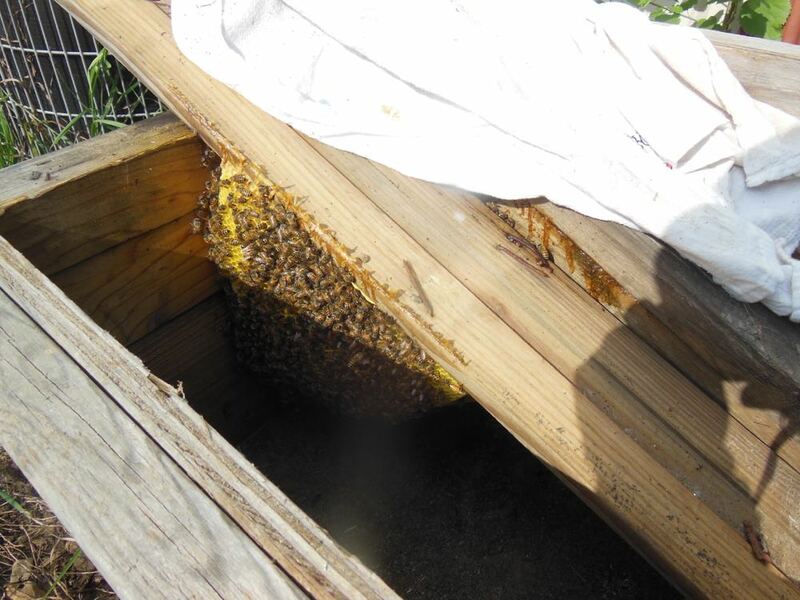 Basically we were looking at a makeshift top bar hive where the top bars were 1x4 inches wide. The president of the company where we were removing the bees suits up to lend a hand. Luckily this wax comb was hanging down nicely, one piece of comb per wood slat, so it was relatively easy to carefully remove. I draped the kitchen towels over the remaining bees and comb while we carefully removed each wood slat at a time. Much better than using smoke, especially when the honey bees are as calm as these were. 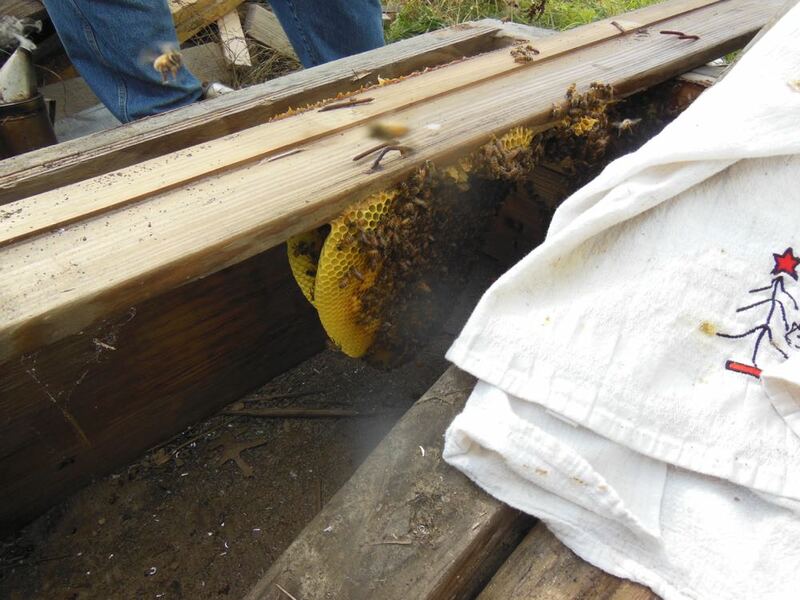 Honey bees built their wax comb on the bottom of the wood in the pile. Here's another piece of comb hanging from the last piece of wood we removed from the wood pile. A makeshift work station nearby is used to cut comb into frames and held with rubber bands. 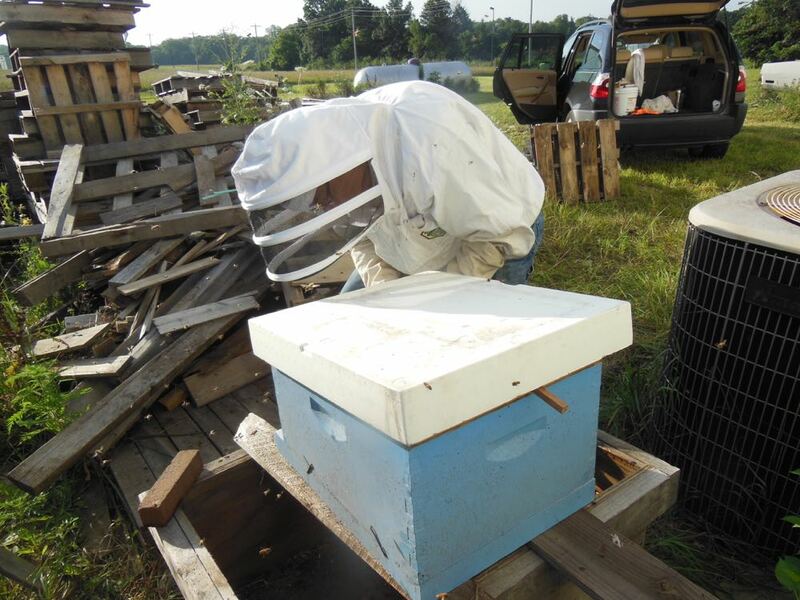 Once all of the wax comb was removed, and the queen caged, we brought in a hive into the wood pile to leave for a couple of days so the bees would settle in before moving. 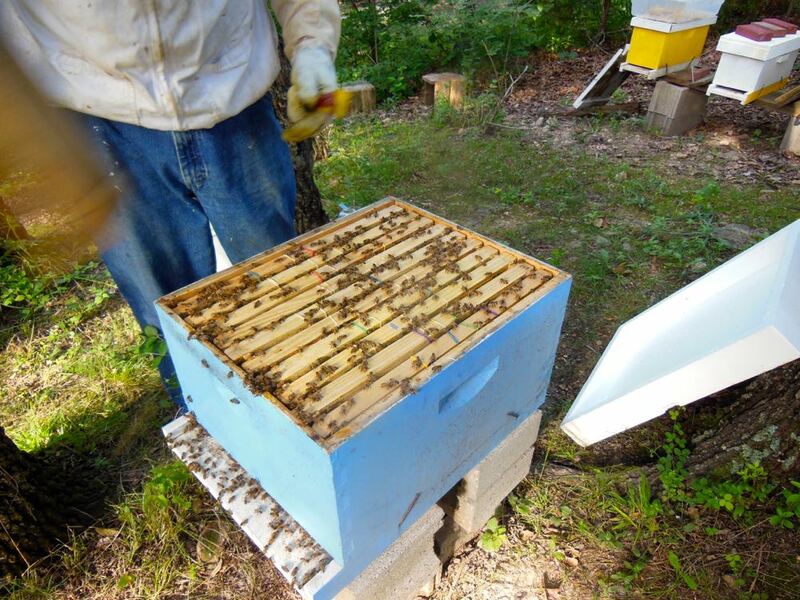 David sets an empty hive with a queen in a clip inside to attract bees to the new home. After a few minutes, bees start going into the hive after the queen's welcoming pheromone. In the video you will see the bees moving into the hive all by themselves. They are following the queen pheromone into their new home. We left the hive in place for a couple of days, then went back after sunset to pick it up. By going after sunset, most of the foragers were back so we had most of the colony. We settled them in David's apiary. 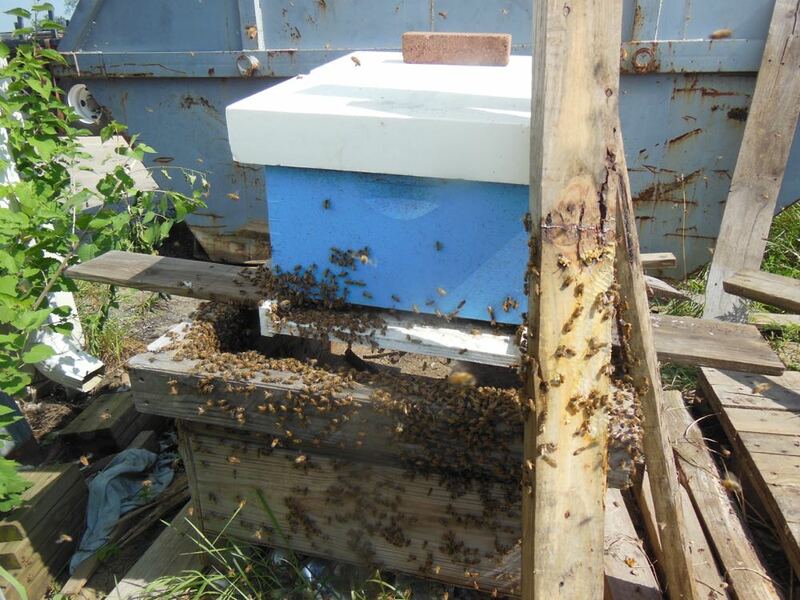 The new colony settled in David's apiary on concrete blocks for a base. 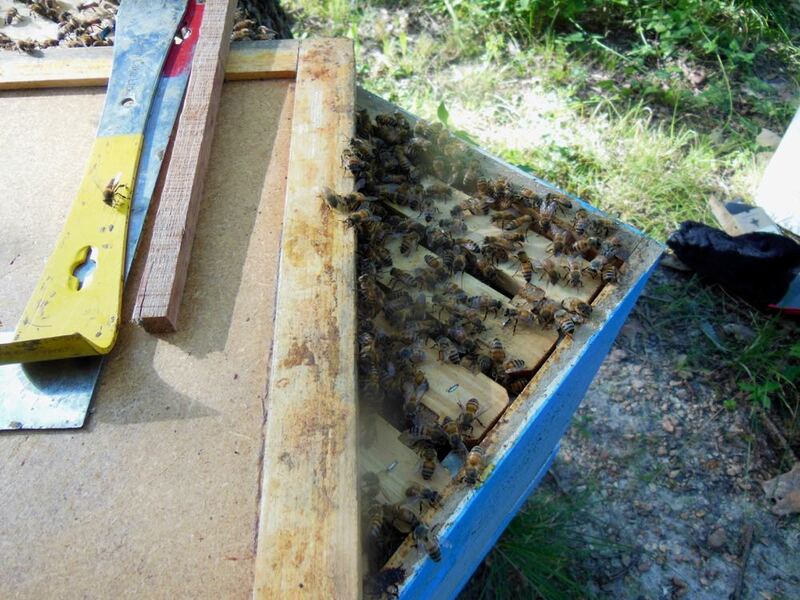 David pulls out the rubber-banded frames to see if the bees are building wax to attach comb. This turned out to be much more than a swarm, it was a nicely-established, and large colony that nicely made the move. This metal garden decor was covered in snow, suggesting the visitor was a bee. Ever since I started keeping honey bees eight years ago, my perspective on life continues to change. I was already sensitive to nature, enjoying the passing of time through what was blooming, or migrating, through my certified wildlife garden. It's more than noting the weather forecast, it's becoming in sync with nature's evolution and making it part of one's personal awareness, and schedule. When monarchs were scheduled to migrate through my property, I scheduled time on my top house deck to enjoy seeing them fly by. It's not for everyone. One of my friends lives in Washington D.C. in a huge building apartment. She walks to the subway system through the building basement, then gets to her office through another underground labyrinth, never seeing, or feeling, the daily weather conditions. I spent a week with her and although I enjoyed the quality time, I didn't enjoy the lifestyle. I missed seeing the birds and bugs that keep me company in my garden and my regular chores of taking corn, adding suet and pouring seeds into feeders. In winter, I look for footprints through the snow, or mud, to see what creatures have been moving through and eating. In summer, it's wonderful to sit at one of my reading nooks and watch birds bathing in bird baths and checking out bees in my bird baths and bird feeders. I also enjoy seeing the different shapes my flowers take when they are covered in snow, I call those snow flowers. 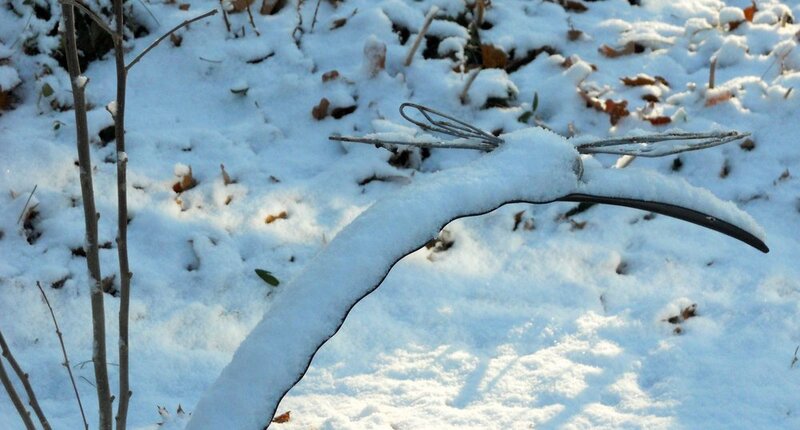 When we had our last snow, I laughed when I saw my garden dragonfly sculpture covered in snow. If when it snows my plants transform themselves into snow flowers, why not a "snow honey bee"? A friend's daughter made this display for her career day entry. Can you tell her Mom keeps bees?? Would you please use that in a sentence? That was my first thought when I saw the word, as one would ask if one were in a spelling contest. Not that "apiarist" doesn't make sense since Apis is Latin for bees. If you've been in beekeeping for any time, you've come across a number of reasons why people have bees, and a variety of terms used to refer to people who chose to regularly be around bees. For example, there are the traditional bee"keepers," the ones who are held to a higher standard than the bee"havers," who place a hive on the back 40 and let the bees fend for themselves. You can start a small war between two beekeepers about whether their beekeeping practices fall into which one of these categories on how they manage hive pests. "Apiarist is a fancy word for a beekeeper. An apiarist enjoys working with an unusual kind of pet, the honeybee. Because bees and other pollinators are so important to a healthy environment scientists encourage “bee-spotting” to improve fruits and vegetables." And that now makes me an apiarist as well as the crazy bee lady. Saying on the side of a leading beekeeping supplier. Beekeepers like to make the distinction between "bee have-rs" and "bee keep-rs." Some people who have bees don't do much with them and usually loose them within the first year. Those are considered people who "have" bees. Beekeepers have more of a direct relationship with bees. Depending on why one keeps them, bees can contribute to a garden's pollination; provide honey, and supplement income with the sale of bees. Those three purposes require different approaches to the bees, which in part explains why when someone asks two beekeepers one question they may get 5 different answers. To me, beekeeping is just that, inviting bees into my garden and having them as part of my happy garden ecosystem. I have honeybees and native bees, both sharing my hillside garden and adding to the diversity I encourage along with butterflies, beneficial insects, birds and other wildlife. 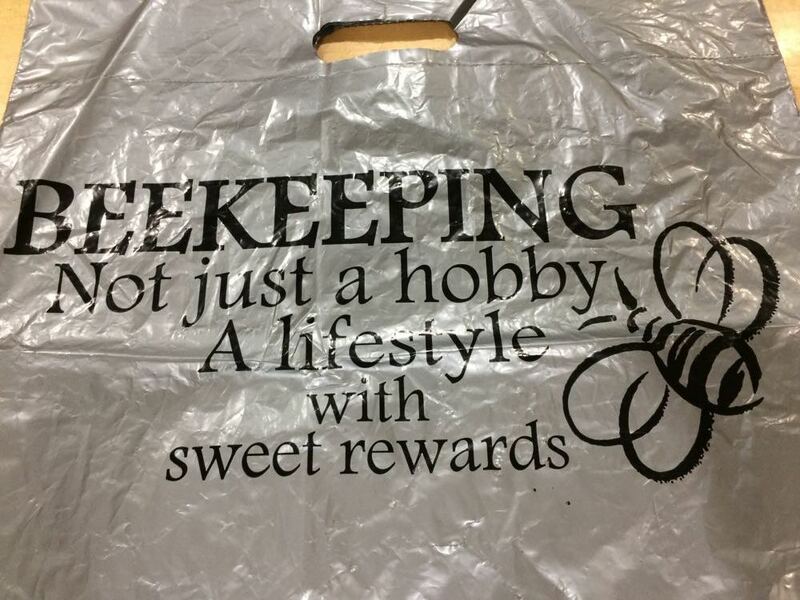 And I agree with the saying on the grey bag, it can become a lifestyle with delicious sweet rewards. This gift of Nestle hot cocoa includes a little bee as the source, how cute! Ever since I started beekeeping in 2010, I see bees all around me. I don't mean my bees are always with me, although some tend to be, especially when I'm working in my garden. It's a new awareness I have to bee-related references, and items. A friend recently gave me a gift of hot cocoa in a cute coffee-like mug. She picked the mug, she said, because she knew I was a gardener and loved flowers. What a charming surprise to find the hot cocoa that accompanied the gift mug had a bee on it. When I mentioned the bee, she was also surprised, she said she had not even seen the bee when she selected the cocoa. That's okay, I told her, the bee just makes it that much more special, don't you think? It's been a record warm Missouri November 2016. Usually by now I have all of my hives tucked in for winter, all of my plants in my garden and my hot cocoa stash refreshed. I am behind on getting all three done. When I heard the weather forecaster call for below freezing temperatures by the weekend, I decided I had to make getting my bees ready for winter a priority. I can't do a last inspection, my bees have their wood hives nicely sealed with propolis and I don't want to break those seals. Instead, I removed the frames on the edges to peek down inside and make sure there was nothing obviously amiss. I also refreshed my small hive beetle traps so on those days when temperatures warm up again, hopefully I can catch some of these sub-Sahara Africa pests that earlier this year caused havoc with some of my colonies. To get ready for winter, I also made sure all of their hive entrances were reduced. I will reduce the entrances even more in the next couple of days to one bee-width holes but right now, several bees can easily get in and out of the hives. The feeding shim on top gives bees another entrance in case the bottom gets snow-covered and makes it easier for me to feed them mid-winter. I also added my feeding shims to the top of the hives so that I can easily feed them if need be mid-winter. The shims are about 2 inches wide with two little holes that give the hive an alternate entrance in case the bottom door is blocked with snow. I like to add the shims now so that when I need to feed them, I can do it quickly later. I have one more step I will finish once the temperatures drop, I will wrap my hives in a black insulated material to help keep the wind from chilling the colony. Hard to think about not seeing my bees now that cold weather is here. They are very much a part of my garden and the joy I feel when I am in it. In case no one has said anything, keeping bees definitely changes one's perspective on life. In addition to the big picture shifts - realizing the role pollinators play on our planet - there are the little perspectives, too. One of the more controversial is the actual word, "honeybee." As a beekeeper, I tend to focus on whenever I see the word, in this case on a menu of a local deli. But I also recall a very heated debate between two experienced beekeepers about whether the word is one word, as in honeybee, or two words - honey bees. Since honeybees are the only bee in the world that produces enough honey to share, it makes sense that they would be called "honey bees." However, joining both words into one also makes sense. The Oxford Dictionary, thankfully, says both spellings are acceptable. Isn't this a sweet little painted bee? I had stopped by my bee buddy David's house to return something. Actually I was dropping off a six pack of beer someone at a club had recommended where I had recently lectured. I also had something that belonged to David but returning, and borrowing items from each other, is a regular habit. This was a visit just to bee chat, something we frequently do on each others decks. We have been beekeeping and sharing our adventures, and equipment, for years. David also happens to love beer so I was pretty confident he would quickly volunteer to give it a taste test. Besides being the darker beer David likes, this beer had a special ingredient - honey. While waiting for David to come out, I saw several bee hive boxes neatly stacked up in his driveway. I recognized some pieces he had borrowed from me; then next to them, a couple of hive boxes from our mutual bee buddy Cheryl. For the record, Cheryl also likes beer. Hard to miss one of her boxes, she had little bees painted on the side! This hive box was painted by high school students in a local art class. The charming paint job was by a local high school student art class. The honeybees are flying over a series of painted flowers, so pretty against the honey brown hive body color. Yes, bees have colored the way I now see the world. I can't imagine not sharing adventures with wonderful beekeeping friends, brought into my life because I followed the bees. This beer was available at our local Aldi's store in Rolla, Missouri. David says the beer is "very good." He likes to follow the honey.